Kinori Rosnow graduated this May from Oberlin College and is now on the sidelines coaching for Seattle Starz this summer. 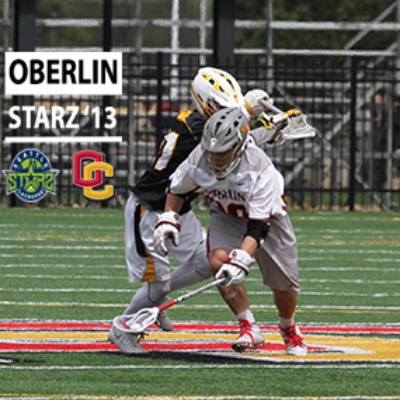 The Yeoman FO standout took a moment to discuss how playing Starz prepared him for his collegiate career and beyond. How did playing for Seattle Starz help you to be successful in college, both on and off the lacrosse field? Seattle Starz demanded excellence. The expectations the Starz coaches have are consistent improvement, full effort and proper execution. This helped me learn to handle high pressure situations with composer. Because of this I have been able to confidently perform on difficult assignments, exams and internship/job interviews. College lacrosse teams play and lift regularly throughout the year together building more chemistry. This in combination with the elevated skill, athleticism and lacrosse IQ quickens the pace of play. Decisions need to be made faster, and plays executed correctly. Most of the differences between high school club lacrosse and college lacrosse are little details. At both levels players can shoot, pass and carry the ball. College lacrosse demands more precision in execution. Finally, since professional lacrosse isn’t as large as professional football or basketball, most players aren’t focusing their efforts in entering “the next level”. Their current team is their primary focus and they play for the sake of their team. Forgive yourself. I used to dwell on my mistakes and it would hold me back from playing to the best of my ability. Confidence, trust and a short memory allow players to live in the present and just focus on the current task at hand. This is crucial for in game success. What drew you to coach with Seattle Starz this summer? And what is the best part about coaching for Starz? I wanted to help players get the opportunity to play college lacrosse like I did. Collegiate athletics is a unique and rewarding experience. I want Seattle to be the next hot bed for lacrosse and Seattle Starz players to be a favorite among recruiters. Starz draws the best players in the area which has given me the chance to coach talented, passionate young men that put in the effort to improve. Now that you’ve graduated from Oberlin, what are you plans? I am moving to Tokyo, Japan and working for an engineering company called Tecdia. I have found a lacrosse adult league I will be able to participate in while living there. I’m not sure of a specific moment. My favorite moments in lacrosse are usually when I have had a long shift on the field, but have one more task ahead of me and I am unsure of how it will go. There is something about the challenge and uncertainty that makes the sport more thrilling. Moments like these are a green light to go all out and give everything you have. I love these moments because there’s no hiding who you are. No amount of talk will cover up how you execute in moments like these. What has college lacrosse revealed to you about yourself?